Parkinson’s disease leads to progressive deterioration of motor function on account of dopamine-producing brain cells. The exact cause of this disease is still unknown. It is believed that both genetic and environmental factors influence this condition. Most of the patients are diagnosed with this condition in their 60s, though early-onset Parkinson’s also occurs. Parkinson’s is classified into different stages according to the severity of the condition. Tremor, stiffness, slowness, balance impairment are some of the symptoms of Parkinson’s. 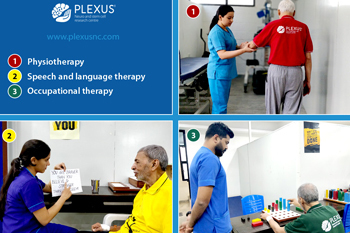 Rehabilitation is considered as an auxiliary to pharmacological and surgical treatments for Parkinson’s disease (PD) to maximize functional ability and minimize secondary complications. A host of services for rehabilitation of both the motor and non-motor symptoms of Parkinson’s Disease is available. Clinical studies suggest a multi-disciplinary rehabilitation approach is key in the management of Parkinson’s; therefore working very closely with other health-care professionals is very important. As Parkinson’s affect differently in different people, their response to treatment is also different. A tailor-made rehabilitation program is what is needed. Professionals involved in the rehabilitation of Parkinson’s must have specialized training that allows them to provide the medical, nursing, and therapeutic care to people with this condition. The goal is to maximize a person’s ability to function and to maintain quality of life. The interdisciplinary team is headed by a neurologist or a neuropsychiatrist, the physiatrist takes care of the rehabilitation protocol, the physiotherapist works on improving the strength, endurance, flexibility and walking pattern/gait of the patient, the occupational therapist helps to get the patient back to the daily routine and works on improving the quality of life of the patient both at home and in the society, and the speech therapist works on the language and communication skills of the patient. All these professionals work together on various aspects and aim to bring the patient back to his pre- morbid state to the maximum. Research has shown that regular physiotherapy benefits people with Parkinson’s disease to reduce stiffness and improve mobility, posture, balance and gait. Strength and endurance training, flexibility, gait and balance training are also done under physiotherapy. Occupational therapy services aid people return to their day-to-day activities, such as working, grocery shopping, cooking, cleaning, and caring for a family member or pet. The objective of this service is to help a person with Parkinson’s disease function as independently as possible. In order to find out which skills a person needs to work on the occupational therapist uses a process called remediation and compensation. A person’s physical, cognitive, perceptual and visual skills are assessed and the occupational therapist determines how well a person is functioning in each of those areas. The therapist then gradually teaches the person the skills needed to accomplish a particular task safely. Guidance on how to use equipment, such as canes, walkers and wheelchairs is also given if necessary at the appropriate time. Parkinson’s disease affects a number of aspects of communication including the ability to remember certain words, the way the voice sounds and how loud it is and facial expressions. The extent of the damage caused by Parkinson’s on a person’s communication depends on the stage of the disease; it could be either slight or significant. For some people, change in voice production is the first sign of Parkinson’s, whereas others may not have this change for year despite affected with the disease condition. There are speech and language services that focus on detecting and treating a speech disorder known as hypokinetic dysarthria, a common problem in people with Parkinson’s disease. Other problems, such as low volume, poor differentiation of the words, and rushed speech, are also treated during speech therapy. Speech and language therapists teach methods for improving speech and maintaining the ability to speak clearly and be understood. Most swallowing problems of the people with Parkinson’s can be managed, although the treatment will depend on the type of dysphagia one has. Treatment will depend on whether your swallowing problem is in the mouth or throat (oropharyngeal dysphagia), or in the oesophagus (oesophageal dysphagia). Treatment for dysphagia may be managed by a group of specialists that may include a speech and language therapist (SLT) and a dietitian. Inpatient rehabilitation offers customized inpatient services for people with Parkinson’s disease. Unlike in a hospital setting, where most treatment and monitoring are provided at the bedside, people in the inpatient program actively participate in daily treatment sessions. The extent of the inpatient stay depends on a person’s medical and rehabilitation needs. The length of the stay is estimated at the time of admission and adjusted if necessary. In inpatient rehabilitation people with Parkinson’s disease and their family members work with an experienced team, which may include nurses, social workers, occupational and physical therapists, speech-language pathologists, psychologists, nutritionists and other rehabilitation experts. Outpatient programs are designed to help people with Parkinson’s disease progress toward their rehabilitation goals. This program is conducted under the supervision of a therapist who imparts skills required to improve strength, coordination, balance, endurance, and the ability to perform activities of daily living. Staying active is an integral part of treatment for Parkinson’s disease. Clinical studies have proven that exercise and physical therapy may improve some of the motor symptoms associated with the condition. Fitness classes are also a part of this rehabilitation protocol. Here people with Parkinson’s are helped to relearn the skills that enable them to participate fully in activities at home and work, and in recreational settings. During this program, various experts, such as physical and occupational therapists, social workers, and psychologists, work as a team to help each person with Parkinson’s disease achieve his or her goals. The team involved in this process gives inputs to help a person function at home and at work, as well as in recreational environments. For example, specialists may suggest assistive devices like cane or walker or modifications, such as adding a handrail or stairway at home if they find that would improve safety and accessibility of the person.